Check out the Dallas Cowboys' Top 25 Free Agent Targets on the Cowboys Report with Tom Downey. The Dallas Cowboys have about $50 MM in cap space this offseason. The majority of the Cowboys’ cap space will most likely be used on contract extensions for key players such as Demarcus Lawrence, Byron Jones, Dak Prescott, Ezekiel Elliott, Amari Cooper & Cole Beasley. However, the Cowboys could still look to add some veteran help during NFL free agency. Dallas Cowboys Report Host Tom Downey breaks down the 25 NFL free agents the Dallas Cowboys could potentially sign during the 2019 offseason. Should the Cowboys look to add a veteran backup QB like Robert Griffin III? Will the Cowboys bring back Dez Bryant to pair alongside Amari Cooper? Are the Cowboys interested in adding a proven veteran tight end like Tyler Eifert or Jared Cook? Will the Cowboys add a big name free agent safety such as Earl Thomas or Landon Collins? 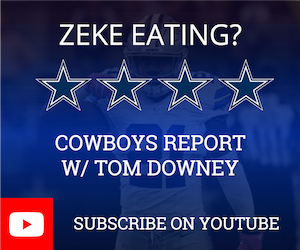 Find out on the latest edition of the Dallas Cowboys Report with Tom Downey! Head to BetDSI and use promo code COWBOYS120 to get a 120% deposit bonus! Stick with us in the Chat Sports app or follow Dallas Cowboys Chat Sports on Facebook to be the 1st to know every breaking story and all the rumors on the Dallas Cowboys.